PanARMENIAN.Net - Cher watched on Monday, December 3 night as three actresses — Stephanie J. Block, Teal Wicks and Micaela Diamond — stepped into her shoes at different stages of her life. 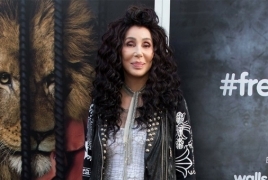 This wasn’t the first time the multi-hyphenate singer-actor extraordinaire was viewing "The Cher Show", but that was the case for most of the audience at opening night of the Broadway production at the Neil Simon Theatre in New York, The Hollywood Reporter says. Guests like Tina Fey, Keegan-Michael Key, Bernadette Peters, Kim Kardashian, Kanye West and more turned out for the musical's premiere, which ended with a stage appearance and short performance of "If I Could Turn Back Time" from the real Cher, accompanied by Block. The Cher Show itself includes 35 hit songs by Cher - an Armenian-American pop icon - and a handful of her contemporaries, along with costumes designed by her longtime fashion collaborator Bob Mackie and portrayals of people like Sonny Bono, Lucille Ball and Robert Altman. Contributing to the person that Cher is, however, proved to be “nerve wracking” for two-time Tony Award nominee Block at first. But over time, her focus became “protecting” Cher. According to The Cher Show’s director Jason Moore, the idea for three different Cher actresses came from book writer Rick Elice, who had a previous bio-musical hit with Jersey Boys. Part of what Cher wanted to include, according to Block, was the “human aspect” of her story.